British politics and American politics have a history of mirroring each other. From the elections of progressive governments as a response to the Great Depression to the conservative leadership both countries found themselves under throughout the 80’s to the slightly left-leaning but largely centrist governments ruling Great Britain and America in the late 20th century, it seems at times like the Revolutionary War didn’t accomplish that much after all. While it may seem like this trend is being broken currently, as the UK’s Cameron and the US’s Obama are on differing sides of the political spectrum, these two countries are facing very similar situations on another, smaller scale. In the US, facing an upcoming presidential election, Bernie Sanders is enjoying a surge of support that was largely unexpected by the news media and Sanders’s fellow candidates. Two recent polls, in fact, show Sanders with a lead over Hillary Clinton in New Hampshire, even though she has been touted as the presumptive nominee for years. Across the Atlantic, however, another candidate, Jeremy Corbyn, is currently enjoying a similar rise in the leadership election for the UK’s current second largest party, Labour. According to most major polls, Corbyn finds himself with a clear and absolute lead in the race. Much of the support for these two candidates does not come from the party’s establishment. In fact in both cases some senior party leaders are actively campaigning against these two candidates, and yet—largely due to their presence on social media and support from engaged and politically active young people—their popularity has not waned. And yet, any basic observer would realize one thing about both of these candidates that is, interestingly, fairly unexpected: Both are old, white men. The election of Barack Obama in 2008 was a watershed moment in American (and world) history. When Obama placed his hand on the Bible and took his oath of office, it was clear that the 21st century would be full of leaders whose hair isn’t as white as snow and whose skin isn’t pastier than Elmer’s. So why is it that two politicians who fit this description perfectly are generating so much excitement? This question can be answered simply and easily: They seem to be fighting for the people. The parties that both Bernie Sanders and Jeremy Corbyn are vying to be the leading face of (the Democratic Party and the Labour Party, respectively) are seen by many as out of touch with the general public, no longer representative of the groups (the working and middle classes and the segments of society that preach social liberalism, to name a couple) that they claim to champion. In a time where most politicians seem to be willing to say anything to get themselves in power, including lending their support to now-popular policies that they once ardently opposed, Sanders and Corbyn seem honest and almost wholesome. They stated their positions a long time ago and have stuck to them. Bernie Sanders supported full equality for gay Americans 40 years ago, when doing so wasn’t particularly popular. He did it because he felt that it was the right thing to do. Jeremy Corbyn was one of the leading voices in the UK parliament against the ill-fated 2003 invasion of Iraq that not only killed over a million people but has led to the formation of groups like ISIS. Corbyn did this even though the Prime Minister of the United Kingdom, Tony Blair, was a staunch supporter of the war and a member of Corbyn’s Labour party, and Corbyn knew he would face opposition from his colleagues. Corbyn, however, refused to be swayed from his beliefs. The rise in prominence and popularity of these men illustrates something interesting: When you speak honestly and with conviction, you may find that you have more supporters than any observers or commentators (or perhaps even you) could have dreamed of. In addition, the beliefs of these men, which many say are too radical and leftist to be supported by the electorate, are actually very popular. Polling suggests that 63% of Americans support a $15 an hour minimum wage as has been proposed by Sanders and that 60% of Britons support the re-nationalization of railways, a policy which Corbyn has long been in favor of. The honesty and integrity these men project, coupled with general support for their positions by the populace, has elevated them to near-rock star status among supporters, leading them to hold standing room-only rallies and attract widespread support on social media. We won’t know whether or not Corbyn will become the Labour party’s new leader until September 10th of this year and we won’t know if Sanders will become the Democratic nominee for president until late July of next year, but what these men have shown us is important regardless of whether or not they are elected to the positions they seek. 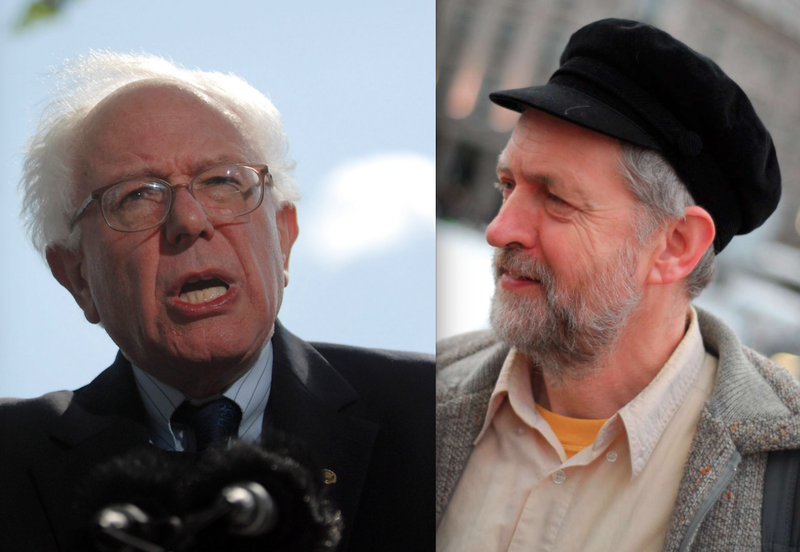 Jeremy Corbyn and Bernie Sanders have shown that people still care about ideas. Even in the face of better-funded campaigns with more endorsements and support from big names in the party, they are still attracting masses of supporters because, in the end, all that truly matters is what a candidate believes. And so, despite being thousands of miles away from each other, Corbyn and Sanders are leading remarkably similar campaigns with hundreds of thousands of supporters. Only time will tell if these underdogs will emerge victorious, fired-up and ready for their next fight. Previous The Place I Call My Motherland: My Summer in India by Sonali C.
Next Bubble A for No: The Injustices of Standardized Testing by Caroline T.